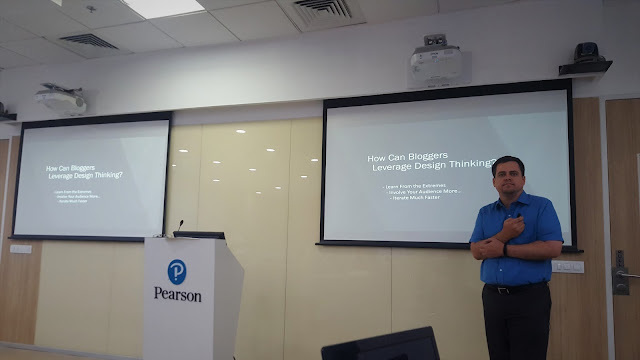 Last Week Pearson Professional Programs (PPP) organised a Workshop for Bloggers on Design Thinking in Gurgaon. This Workshop was also online/live and so many bloggers also joined this workshop from different states and places. Pearson, world’s leading learning company, organised an experiential session on a learning module of design thinking. I attended this event at the Pearson office in Gurgaon. and got the opportunity to learn about this famous concept from experts. Design thinking is an iterative process in which we try to understand our user and re-define the problems from a new perspective. This way we identify new strategies and dimensions. This session was delivered by Mr. Vikas Singh, MD, Pearson India. He has an experience of over 25 years and has managed various portfolios in marketing and business operations for leading companies. Mr. Varun Dhamija, Vice President Pearson Professional Programs, who has been a part of Pearson since 2009 and belong it achieve great heights. Joseph, Head learning and design at Pearson, an accomplished international educationist and learning program design. He took his training in design thinking and innovation by IDEO in the San Francisco head office. They conducted an insightful session on Design thinking. Design thinking refers to creative strategies designers use during the process of designing. It has also been developed as an approach to resolve issues outside of professional design practice, such as in business and social contexts. Design thinking is a formal method for practical, creative resolution of problems and creation of solutions, with the intent of an improved future result. In this regard, it is a form of solution-based, or solution-focused thinking—starting with a goal (a better future situation) instead of solving a specific problem. By considering both present and future conditions and parameters of the problem, alternative solutions may be explored simultaneously. Design thinking is especially useful when addressing what is referred to as “wicked” problems. In the context of design thinking, the word wicked does not refer to maliciousness but, instead, to problems that are ill-defined or tricky. Now how one can use or Implement Design Thinking in Blogging? If you are blogger then the first thing you should consider for the blog is the design of the blog that is Blog Template, Font Size, Responsiveness, Easy Navigation etc but these are the basic things what’s special? So here Design thinking comes into picture. Implementing design thinking on your blog will definitely help you in engaging your readers and making the best content by taking the feedback from your readers time to time. It is very important to understand what your readers need and if you don’t meet the reader requirements in your blog then there will be no traffic in your blog. You have to find out the ways how you can interact with your readers, how you can engage your readers. And once you are able to do this then soon you will be famous in this field. Design thinking employs divergent thinking as a way to ensure that many possible solutions are explored in the first instance (note areas that widen, denoting emphasis on divergent thinking), and then convergent thinking as a way to narrow these down to a final solution. The Design thinking can be approached as a scientific method of thought, which begins when we start thinking of a problem and check all the different parts of that particular problem. When we finally go through all the parameters of the problem and start thinking to create a solution. These steps are same as we investigate a case to discover hidden settings, which will lead us to find the goal. Because design thinking is iterative, standard solutions are also potential starting points of alternative paths, including redefining of the initial problem. The critical practice that brings forth a great design is the practice of iteration. The iterative process occurs over and over until a plan is considered worthy of implementation. Design Thinking can also help you with your business today. Innovation is an increasingly central topic in the industry today, and design thinking could help you to get innovative ideas that can change the way of your business. Business problems today are increasingly complex and tricky. Hence design and innovation are an essential competency for managers. Furthermore, design thinking plays a vital role in the creation of a learning organisation. In this Workshop we also got a chance to test and use the Adobe Connect Software/Application. Adobe Connect is a software used to create information and general presentations, online training materials, web conferencing, learning modules, and user desktop sharing. The product is entirely Adobe Flash based. Currently, India has the most significant number of youth around the world and educating our youth is the most important thing which we are looking for. Brands like Pearson is playing a very crucial role in this sector with the help of excellent classroom infrastructure, latest learning technology, growing support and an emerging IT sector. The Pearson is providing various opportunities for the young generation to flourish with their skills. As India is a massive marketplace for digital learning and Pearson is looking forward to providing a quality education. Pearson Professional Programs (PPP) partners with leading educational institutions, faculty and content providers from around the world to help working professionals update their skills and progress in their careers while making substantial improvements in the organisations that they work for. Their blended executive education programs span a variety of functions and industries, for participants of diverse seniority levels (top, senior and middle management). They deploy cutting-edge learning technology, classroom infrastructure and pedagogical methods. Although their faculties are leading experts from around the world, each program is carefully contextualised to speak to local business realities. Their solutions are cost-effective, flexible, learner-centric, scalable and are aligned with business goals. Their enterprise learning suite includes new manager entry point training, programs in the domain of business and management, new-age skills, and custom learning for senior leaders. For more information, please visit Pearson Website.